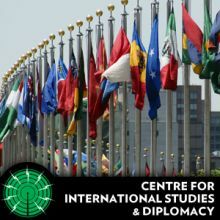 Established in 2000, the Centre for International Studies and Diplomacy (CISD) at SOAS is a research-driven unit committed to the promotion of excellence in scholarship and teaching. The Centre is committed to the development of applied international studies and to ensuring that its work impacts key international debates. The CISD podcast series is a collection of lectures, debates and conversations exploring international affairs. Issues ranging from nuclear proliferation to humanitarian intervention are discussed by a mix of prominent scholars, students and practitioners. The series aims to capture the multi-disciplinary approach of the Centre as well as its advocacy of the some of the more non-conventional or marginalized issues in international affairs. On the 26th of November 2013, Professor Randall Woods gave a talk about the role the CIA played in Vietnam and the impact that CIA director William Colby had.